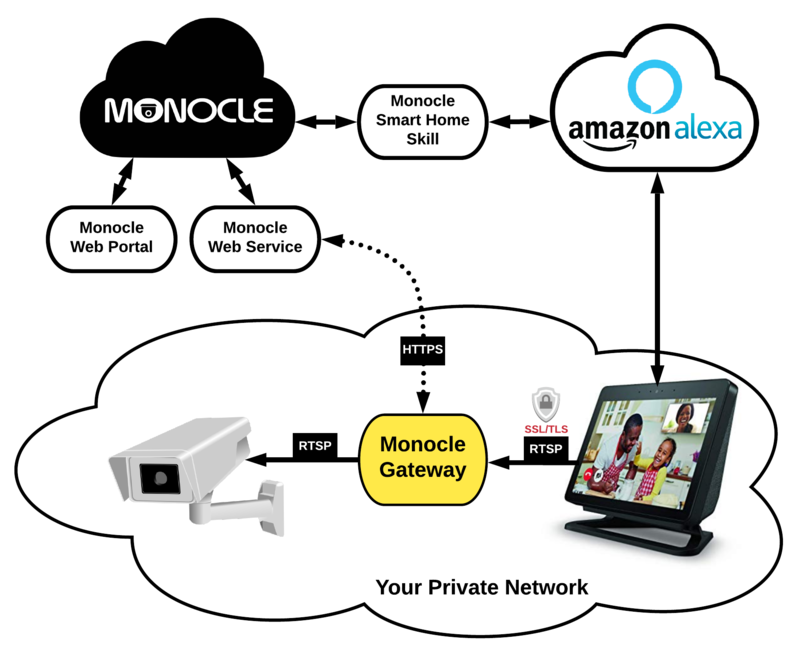 The Monocle Gateway is a small service that runs on your local network to coordinate communication, encryption and security between your Alexa enabled devices and local IP cameras. When using the Monocle Gateway service, all camera steaming communication (RTSP) is securely routed through the Monocle Gateway service via SSL/TLS encrypted communication on HTTPS port 443. The Monocle Gateway service is REQUIRED when using Monocle with FireTV 4K and newer FireTV devices as well a newer Fire Tablets. Amazon enforces strict communication requirements and only permit RTSP connections from these devices to camera endpoints over encrypted (TLS) transport layer, only permitted to connect on port 443, and only using fully qualified domain names with valid a SSL certificate. The Monocle Gateway service acts as a bridge by fulfilling these requirements and enabling communications with your local IP cameras. The Monocle Gateway can also be useful in certain networking scenarios where you wish to fully isolate the IP camera traffic to a dedicated/private network or VLAN. The Monocle Gateway can act as a single entry point (tunnel/proxy) for access to the IP cameras provided that the Alexa devices can access the Monocle Gateway on port 443. The Monocle Gateway is a replacement for the previous Live555 RTSP proxy (workaround) and is fully integrated with the Monocle platform. Separate proxy RTSP URLs are no longer needed with Monocle Gateway.